There is nothing that makes watching NFL more interesting than having a Fantasy Team. I had friends who already played in paid leagues. Before I went that direction, I wanted to see if I could compete by playing on a website with strangers. It started out really easy with the computer doing all my drafting for me. The hardest part seemed to be guessing who to play each week. Despite my savvy on players, it was still hit- and-miss if a player had an off week. Also, it would have helped had I discovered the add/drop capability to get rid of players who were on extensive injury or just stunk. I was like a magnet for attracting both. The first year I played I finished a dismal next-to-last in my league, but I was still having fun! Fast-forward to 2010. 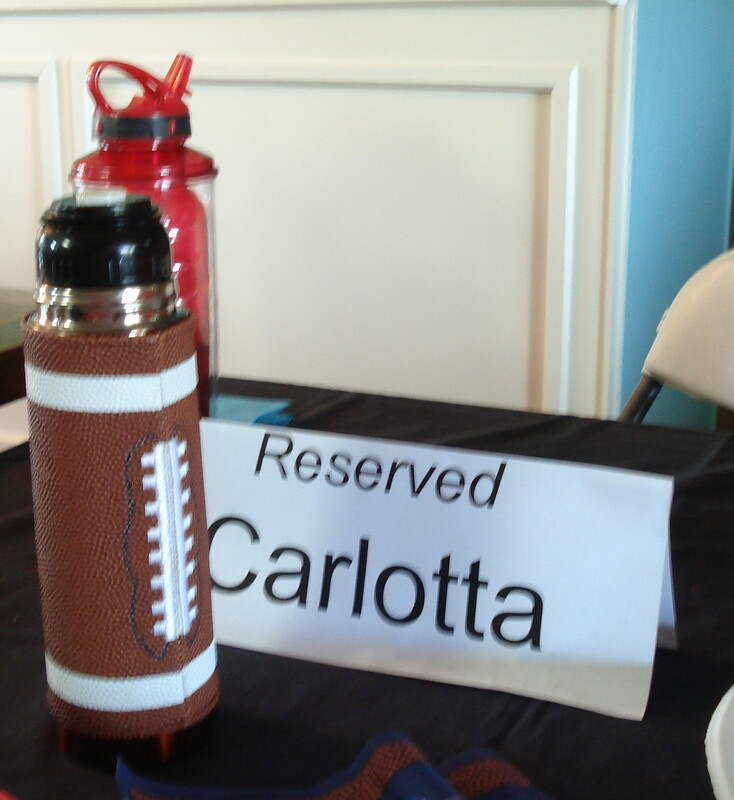 My friend Laura, who knew my passion for football, invited me to play on her league. I thrilled to be playing with someone I knew and besides that, the draft was to be an all-you-could-eat Saturday afternoon. When I arrived, Laura’s husband Alek was frying a turkey as Led Zeppelin blared from the radio. The kitchen was loaded with all kinds of food. It was evident none would starve at this draft. I knew their daughter Emily since my Boxer Roxie & I did Pet Therapy at her school. She hugged my knee and asked where Roxie was. She then, along with her younger brother Tyler, escorted me to my assigned seat at a card table adjacent to the main table. I laughed as it reminded me of my many years of sitting at the kids’ table at holiday time. I spread out my Fantasy Football magazines as well handwritten notes and a highlighter leaving just enough room for a small paper plate and my bottled water. Several in the group were decked out in football jerseys. Although I was a known Steelers fan, I came decked out in a Tom “easy-on-the-eyes” Brady shirt. The first order of business was drafting two rookies. I was the last to pick since it was my first year in the league. 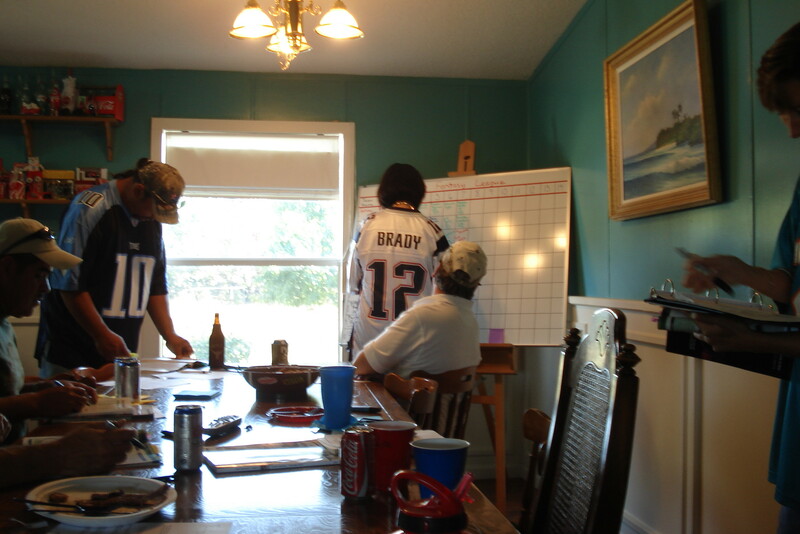 On the board I wrote the name of a tight end that caught my eye during pre-season – Aaron Hernandez. My other rookie was Dexter McCluster. (He ended up injured early in the season. My luck with injure-prone players followed me!) Next we drew numbers for the regular draft. I was last to pick and got “5” so I was right in the middle of the choices which snaked up and down the board each round. The four guys in front of me chose the highest rated running backs and receivers. I decided to go against the grain and grab my quarterback. I wrote “Aaron Rodgers, GB QB” on the grease board. A gasp filled the room! Alek shouts, “Dang it woman! You’re wearing a Tom Brady shirt and you draft Aaron Rodgers!?!?! ?” The number-one ranked quarterback was off the market! The regular season that year found me activating the wrong players and dealing with injuries. I was miserable in the cellar. However, come post-season, my luck changed. It began with downsizing my team for the playoffs. I was the only one who had all the positions covered for post-season play. I was solid with Rodgers, Pittsburgh’s Defense and Special Teams, speedster Mike Wallace and Rashad Mendenhall who was churning up yardage each week. All the other league members had to re-draft positions. It was the year Green Bay and Pittsburgh met in the Super Bowl. Talk about an internal conflict!!! With $150 on the line if Aaron Rodgers got points from passing and scoring touchdowns, I found myself quietly rooting against my favorite team! In addition to winning the Super Bowl pot for Fantasy Football that year, I also played the Super Bowl squares with some other friends. My numbers were “1” Green Bay and “5” Steelers — the final score — Packers 31, Steelers 25. It was a feat I have yet to accomplish again in either venue. Our league still plays and members come and go. We also increased to twelve players instead of ten. I love my team this year with Russell Wilson at the helm and the 49ers Defense and Special Teams. The first week of league play I had the third highest score, but I was playing the top scorer so I lost the week. I lost in both my internet leagues too! Again I am off to a smashing start in the cellar!! I prefer to look at it as good sign — remember 2010! Check out my sponsor — WOOFING CAMP — It’s more than a place to board your canine!